Everyone wants the best quality product they can possibly get at the most affordable price. We are no different when we go shopping. It can be overwhelming ordering a custom saddle and many ask themselves 'how do I sort through which are necessary and unnecessary options?' When trying to stick to a budget, we suggest to lean towards functionality and primarily what is best for the horse. Tooling and special finishes are no doubt unique and look fantastic but they can make a big difference to your pocket book too. 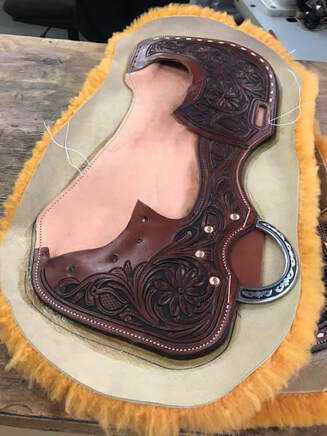 Our Woody's Custom Saddles customers can feel confident that our full roughout baseline saddle will stop the clock just as fast as our full tooled and dyed saddle. No matter which saddle finishes you choose you can rest assured that they are all handmade using the same process, same high end quality leather and same American made saddle tree which all equally deserve the best possible natural fibers for lining. REAL SHEEPSKIN. It can be difficult to the untrained eye to identify synthetic lining on a saddle; however, once you do, it will be equally as difficult to accept anything less than real sheepskin on your custom made saddle. Synthetic lining is primarily used to keep the manufacture's/maker's material costs down and whether they pass those savings onto the customer is maker specific. Real sheepskin comes at more of an expense and some consumers can not recognize the difference in appearance therefore the maker will default to choosing to keep their material costs down. So is the extra cost of REAL SHEEPSKIN worth it? Yes, most definitely. In the words of another respected maker in the the industry. "The supportive nature of REAL sheepskin is notably better than the synthetic. Even the best synthetic material cannot compare to the thick plush stack of fibers that real natural sheep wool provides. This attribute is defined as the “pile” of the hide. Higher quality hides will have a thicker pile to them. This is important to offer the maximum amount of cushion and to prevent the breakdown and flattening of the fibers." This is also why it may take a little more break in time on our Woody's Custom Saddle's compared to synthetic lined saddles as the sheepskin has to warm up and mould to your horses back. "Another advantage of real wool is once you identify the difference it simply just looks better. When it comes to a custom saddle or high quality manufactured saddle, nothing takes away from the overall appearance than synthetic wool under the skirts. Genuine sheepskin just has a look of quality and value that sets a saddle off." 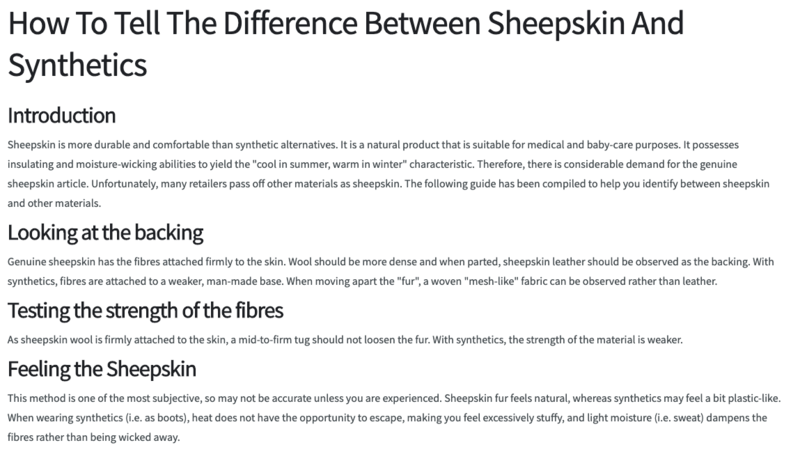 Here is an article taken from a sheepskin processing site to help you identify whether your saddle has REAL or synthetic sheepskin for your information. Thank you for taking us along for YOUR RIDE! We would like to take this opportunity to sincerely thank all of our WOODY'S CUSTOM SADDLES customers. Our biggest reward is being able sit back and watch both horse and rider reach their potential through hard work and saddle fit. We know it takes a lot of work and dedication to be the best that you can be and we are grateful you trusted us to come along for YOUR ride. We are proud to see the confidence in our customers knowing they can perform to best of their ability without hesitation. That being said we are continually fine tuning the fit, form and functionality of our saddles. Conversations in the traditional western retail stores are often centered around gullet width alone; however, there are so many more aspects involved than only gullet width. If you are ever able to come to our saddle shop to see and understand ALL the aspects of saddle fit, you will be on the road to understanding different possible scenarios when it comes to fitting multiple horses in the future. We are continually committed to presenting our customers with what is right for them in regards to saddle fit, as opposed to what is right here, right now. We look forward to meeting new customers in 2019 and also visiting with YOU, our current customers, about your continued successes. Carman Pozzobon had the Canadian torch burning at the RFD-TV The American in the barrel racing right up to the final four round. Carman and her buckskin mare Ripn' Lady clocked a 13.804 in the long round of The American Semi Finals at Fort Worth, TX bringing her back in 5th position to run in the Semi Finals short round. The short round Semi Finals consisted of the top 33 barrel racers from the long round split into three performances, Thursday (10), Friday (10) and Saturday (13). The top ten of the Semi Final performances then advanced to Sunday's RFD-TV The American Finals in Arlington, TX. Pozzobon's Semi Final short round run Saturday afternoon was yet again another solid run placing her 7th with a 13.894 and advancing her to the RFD-TV The American Finals in the AT&T Stadium at Arlington, TX. Pozzobon made it through the qualifying rounds so she was eligible for the extra chance at a piece of the $1 Million dollar pot in Sunday's finals. Sunday's final format consisted of the top 10 qualifying runs (Carman's position) and 10 select invited contestants (World Champions etc.) all vying for 4 positions to run in the shootout round the same day for the RFD-TV The American title! Carman and Ripn' Lady entered the alley as we have seen them do a hundred times here in Canada; calm, focused and as one. It looked like any other day for them as Ripn' Lady ate up every barrel with confidence. A mere brush on the backside of the third barrel took them out of advancing to the final four. We talked with Carman and she was extremely happy with how Ripn' Lady handled the entire week and she already has her sights set on a repeat appearance in 2019! Watch all three runs here! ​NEW SERIES on YouTube.....'Talk with the Winners, The Conversation is Different". What kind of leather is the saddle made out of? This will help to determine the length of life for your saddle. It is well known in the saddle making industry that Hermann Oak leather is the best quality leather available for tooling and durability. When using Hermann Oak leather for barrel saddles specifically, there is no need for doubling or lining fenders and seat jockeys which adds unnecessary weight and bulk under your legs. Is the saddle lined with REAL sheepskin or synthetic fleece? This is one of the most common areas a saddle company will cut corners. It is far more economical to use synthetic fleece to line saddles, which in turn may or may not lower your price point. However, the benefits of lining your saddle with REAL fleece and it’s pounds per square inch shock absorbing abilities compared to artificial fleece, far out weigh the lower price point you may receive. REAL sheepskin lining in our WOODY’S CUSTOM SADDLES was a definite must have. Ask us how you can tell if saddles are in fact lined with REAL sheepskin as opposed to artificial fleece. Is the saddle ‘factory made’ or ‘bench made’? The price point is often an issue in this area. Bench made saddles being a higher price point than factory made saddles. The reasoning for the price difference is quite clear. When a saddle is bench made only a couple people make your saddle and it doesn’t leave the bench from start to finish. This bench made, handmade process ensures the consistency and quality of your saddle. It is not a rushed process by any means. Factory made saddles are made in a production line, more quantity the better, where several people might touch your saddle before it is completed increasing likelihood for error and decreasing the quality of craftsmanship. This is one of the reasons that handmade saddles tend to be a higher price point than factory made saddles. What is inside your saddle? The quality, durability and fit, all start with a quality saddle tree. This is another area a saddle company may cut corners as the consumer cannot see the tree in a finished saddle unless they ask to see one. There are some common pressure points in a finished saddle to look out for which need to be addressed at the tree level. We have ensured our WOODY’S CUSTOM SADDLE trees have all these special features to alleviate these common pressure points. We have also incorporated some special features in the leather of our finished saddles that help to alleviate further common pressure points. Feel free to contact us for information about what to look for when inspecting a saddle tree and saddle. Give us a call directly or schedule a saddle fit to discuss the features in our WOODY’S CUSTOM SADDLES. What is your horse REALLY telling you? Listen to your horse, but don’t put words in their mouth. We are all often overwhelmed by all the information around saddles and saddle fit. We all naturally want the best for our horses but we can sometimes read into problems that aren’t really there. Keep it simple. Visit with us about some red flag signs or behavioural issues your horse might be having if he is experiencing saddle fit issues. Saddle and tree makers have been trying to develop the ‘perfect’ saddle fit for hundreds of years, and it is a guarantee the search will continue for a hundred more. There are so many factors that come into play with regards to saddle fit. No two horses are exactly the same; they may be close but not exactly the same, which is why the ‘perfect’ fit will remain elusive. Individual horses change their back confirmation throughout the year, shifting from being in shape to out of shape and back in shape again (especially here in Canada). Horses will also experience back changes throughout their lifetime as they age. WOODY’S CUSTOM SADDLES’ philosophy is that with an open mind and the right equipment, we can help you attain the BEST POSSIBLE FIT for you and your horse. We feel the different sizes in our WOODY’S CUSTOM SADDLES fit a wide range of horses and people by incorporating some features that we feel are mandatory to great saddle fit. We personally use our products and personally inspect each and every saddle that comes in and out of our doors for quality. Whether it means a saddle purchase from us or not, we aim to help educate our customers the best way we can so you can reach optimal performance and comfort for you and your horse. We understand the demographics and the conditional struggles here in Canada and we are here to help bridge the gap between you, your horse and the BEST POSSIBLE FIT. In the end, if you are in the market for a new saddle, make your own evaluations. Talk to the saddle companies directly to ensure you have the accurate information from each company you are considering so you can make an informed, educated decision. We want to take this opportunity to welcome you to our Woody's Custom Saddles' website. We are still in the construction stage, so keep checking back for updates and improvements in the coming weeks. ​We would like to sincerely thank everyone who has already purchased a Woody's Custom Saddle and/or made one of the many inquiries about one. It has been great visiting and discussing saddles and saddle fit. ​We look forward to seeing new and old customers in 2017!